I’m biased when it comes to Mason jars. First of all, I used to work for Mason Jars Company, maker of reCAP, and have a drawer full of lids and accessories graciously given to me by the reCAP inventor. During my time there, we would continuously come up with creative, fun uses for Mason jars, and looking realistically at how reCAP lids make life a little easier. Here is a great example of maximizing reCAP & Mason jars for multi-purpose, multi-functional containers. I work from home. And lately, starting two new small businesses, I work a lot. Fortunately, I love it more and more each day, despite being the hardest job I’ve ever had in life. I start early, finish late, and peppered in between, I make sure to take small breaks, for yoga, the chair massager, and of course, snacks. Since losing over 80 pounds over the past 2 years, I fear gaining back weight by making bad choices in my diet. Of course, the occasional indulgence is imperative, but on a daily basis, I need to watch out for processed foods, high fat and sodium content, and essentially all the delicious junk food out there. I keep it real, keep it healthy, and of course, keep it delicious. I curb my snack attack and sweet-tooth by adding different textures and healthy ingredients to peanut butter. 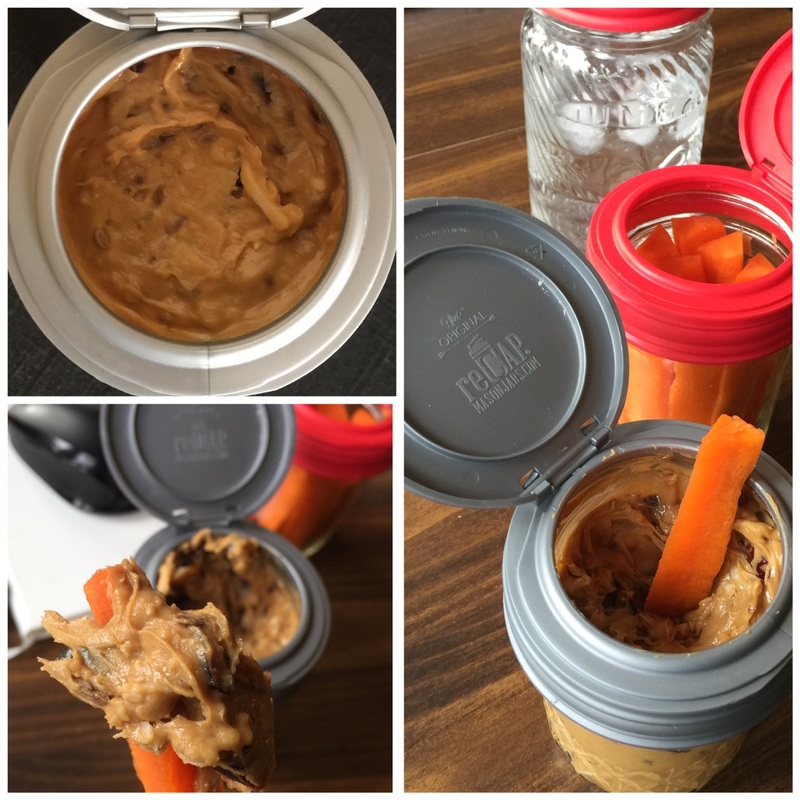 I prepare my jars in the morning – one with peanut butter and one with carrot or celery sticks (don’t worry, they are just vehicles for the deliciousness). They stay fresh, crisp, and readily available for snacking in Mason jars. Fill a small Mason jar with peanut butter about 3/4 of the way up. In this example, I added unsweetened coconut, dried cranberries, and flax seed (about 1 tbsp. of each). Mix and screw on a reCAP. Mason jars also are a great way to control and monitor portion sizes.